"When you fall in love, it is a temporary madness. It erupts like an earthquake, and then it subsides. And when it subsides, you have to work out whether your roots have become so entwined together that it is inconceivable that you should ever part." Movies dealing with love in a time of war are often hampered by the fact that there is too much of one and not enough of the other. Recently, in films including Pearl Harbor and Enemy At The Gates. there has been a swell of melodramatic love triangles set against the backdrop of historic events that have failed to correct this trend. Now comes Captain Corelli's Mandolin, a film based on the immensely popular British novel by Louis de Bernieres that, while equal in parts romantic and adventurous, is missing the key ingredients to make it a lasting story. In Cephalonia, Greece there exists a population that is seemingly lost in their own world. It is a beautiful village and the inhabitants are happy to be away from the raging war that may soon be approaching. It is here that Pelagia (Cruz) and Dr. Iannis (Hurt), a father and his daughter, enjoy a simple life. Pelagia is undeniably beautiful and has become engaged to Mandras (Bale) on the eve of his leaving to help with the Greek war effort. As Pelagia writes countless letters to Mandras she hears no reply and she eventually fears the worst. Soon the Italian army comes marching into Cephalonia and with them the brash, music-loving Captain Antonio Corelli (Cage), who has chosen to live with the doctor and his daughter. At first Pelagia detest Corelli but after some time the two fall in love, only to find Mandras still alive and German forces moving in on the town after Mussolini surrenders. I had no connection with the novel before viewing this film, so I do not know whether the book was in fact "unfilmable" as many have said, although I can see how some may feel that way. It seems as though the adapted script by Shawn Slovo only skims over the characters, rather than providing the details that may well be needed to create sympathy and interest. The passion between Corelli and Pelagia lacks an intensity that can sustain the two-hour length, and we are perhaps the lesser for it. I never felt inspired to care about the outcome of the central relationship and instead, found myself caring more about the supporting characters and their emotions. 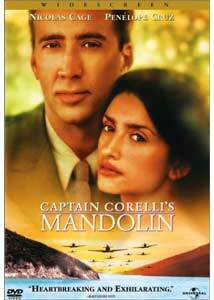 For all of the problems with the script, however, it is in the technical achievements that Captain Corelli's Mandolin is a success. This is a triumph of style over substance in nearly every aspect, chiefly in the cinematography by the ever-amazing John Toll, as well as the skilled direction of John Madden. There are moments that are breathtaking in their design and beauty. Madden is one of those rare directors that know how to use the broadness of the scope lens in his compositions, and the shot involving Pelagia and Madras in a lake is stunning. Toll, arguably the most gifted cinematographer working today, does a wonderful job of filming the beautiful locations, with nearly each scene providing a perfect backdrop. The cast is a bit of a rarity in the fact that, to myself, the supporting actors outshine the lead performances. Cruz is good in her role, though at moments her performance feels forced, largely in scenes her scenes with Cage. As for Cage, well, there are problems in his attempts at this thick Italian accent. As well as this overlaying flaw, his work here is unfortunately average, as he shows no real spark with Cruz in the film's most romantic scenes. His scenes with the Italian soldiers are nicely done and show Cage at his best in the film. Supporting roles by John Hurt and Christian Bale are the high points of the picture, each inhabiting more charisma than Cage and Cruz combined. Hurt gives a wonderful performance as the aging doctor who, while detesting the Italian occupation of the island, still finds a way to use it to his advantage. It is the best work Hurt has done in years. Bale, who belongs atop the list of the best young actors, shows great range in his work and his moments with Cruz have a fire and chemistry that were desperately needed between the leads. Image Transfer Review: Helped by Toll's incredible cinematography, the 2.35:1 anamorphic transfer is, at times, nothing short of stunning. In nearly every scene the colors are beautifully rendered, with one instance in the first chapter that shows a glistening lake looking better than I believe I have ever seen water look on film. Sharpness and detail are perfect, providing a nice film-like appearance. Edge enhancement is never a problem nor is grain, and black levels look to be spot on. A great transfer from Universal. Audio Transfer Review: As is the case with most Universal discs, Captain Corelli's Mandolin is presented with both a Dolby Digital 5.1 mix as well as a DTS track. Sound is of high quality throughout with the latter half of the film becoming a more bombastic experience. From the start, ambient sounds fill the room, as well as the beautiful score by Stpehen Warbeck, creating an enveloping sound experience. As the scenes of war begin, the surround speakers come alive with swooping planes, gunfire and explosions. The .1 LFE channel gets some nice use, including the explosion of a large building that shook my room considerably. Dialogue is crisp and clear with no problems. A comparison of the DTS and Dolby Digital tracks yielded no definitive winner, though as is often the case, the DTS track does seem to be a bit louder. Extras Review: A feature-length commentary by director John Madden leads a scant list of extra features. The director is very well spoken, but there are numerous gaps. He does offer insight into the film as he talks at length about rebuilding many sets due to an earthquake several years ago, as well as working within the confines of the novel. Also of note is that Madden was not the first director; Notting Hill director Roger Mitchell was set to helm the picture, but suffered a heart attack. Rounding out the extra features is the theatrical trailer in non-anamorphic widescreen that is of particularly poor quality, as well as a music video for the Russell Watson song Ricordo Ancor. Production notes, cast and crew bios and filmographies finish out the set. I admired the technical work and supporting performances in Captain Corelli's Mandolin, but sadly neither can compensate for the film's numerous flaws. This DVD from Universal is nicely done, though the supplements are a bit scarce. As a rental you should be safe, but a purchase is not something I can recommend.